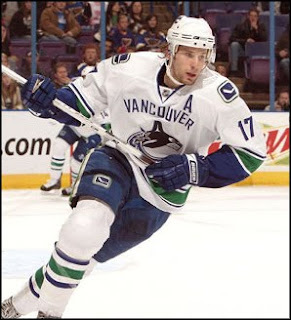 TSN is reporting that Vancouver Canucks forward Ryan Kesler will be featured as the cover athlete on Vision Concepts NHL 2K11 game later this year. Perhaps a curious selection, Kesler definitely appears to be a drop in star appeal from their previous cover athlete - Washington Capital's sniper Alexander Ovechkin. Kesler will likely set a career high in points this year, somewhere between 70-80 points, whereas Ovechkin is a perennial 100 point player. Kesler, it could be argued is a better two way player, one of the better faceoff men and penalty killers in the NHL, but what likely justifies his selection is his personality on and off the ice. Before last season, Kesler was publicly criticized by some Canucks fans for daring to dream or suggest that he could get 70-80 points in an NHL season. With his previous career best being 37, he was definitely thought to be a bit of a dreamer. It was nice to see him set his goals so high and the 2008-09 season saw him register career numbers with 26 goals and 59 points, playing alongside some more offensively minded linemates for the latter half of the season alongside Pavol Demitra and Mats Sundin. Last year, Kesler was also a finalist for the NHL's Selke Trophy, awarded to the league's best defensive forward. This year, Kesler has quietly demonstrated that last year was not a fluke, as he has led the Canucks second line with Mason Raymond and Mikael Samuelsson and through 65 games has already tied his career best of 59 points - putting him on pace for a 73 point season. In addition to his offensive performances, Kesler's heart and determination has endeared him to Canucks fans and frustrated opponents - and never was his determination and work ethic more evident then during the 2010 Vancouver Olympic Winter Games when he represented the USA to a Silver Medal. Kesler was arguably America's best forward throughout he tournament. He won an amazing number of draws, leading the tournament with an unheard of 75% faceoff winning percentage. He tallied the Americans lone goal in the gold medal game against Canada, shut down opposition forwards, and scored one of the more exciting empty netters you will ever see. Clinging to a late lead against Team Canada during round robin play, Kesler pursued Canadian Corey Perry into the Canadian zone, positioned himself at Perry's side, and make took a diving swing at a puck that appeared beyond his reach. Kesler's stick knocked the puck from Perry's stick and into the empty net, securing a 5-3 win for the USA, enabling them to obtain a medal. Kesler has also demonstrated a penchant for candor (whether warranted or not), calling Chicago Blackhawks forward Andrew Ladd a 'coward' for a hit he received from Ladd in last year's playoffs, and he also drew the ire of Canadians for some misquoted comments about 'hating Canada' - which to Kesler's credit were taken out well out of context. Nevertheless, perhaps while Canadian hockey players are classified as modest, selfless and reserved, perhaps Ryan Kesler appears to be following in the footsteps of Jeremy Roenick, Brett Hull and some other more recent American players who aren't shy about speaking their mind and sharing their opinions, no matter how controversial they may be. While Andrew Ladd is no coward, Kesler's comments were undoubtedly undeserved but also great for the game's exposure. The Blackhawks / Canucks rivalry is quickly becoming one of the best in the NHL and Kesler has played well enough these past few years to deserve an opportunity such as NHL 2K11.